Metro riders in Washington, D.C. can now plan their transit trips on Google Maps. In a new partnership with the Washington Metropolitan Area Transit Authority (WMATA), Google announced a recent update to Google Maps that will now include all of D.C.’s Metro and bus stations, stops and routes, as well as connections to other transit systems in nearby cities—a completely new feature. 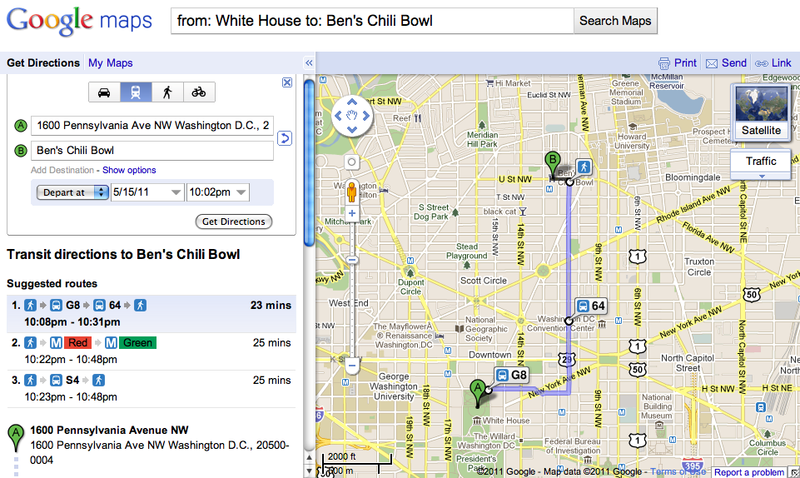 Previously, WMATA’s bus and metro information was not available to Google Maps users as public transit directions. Google and WMATA signed an agreement last July, initiating the partnership and the exchange of information to enable comprehensive public transit information on Google Transit, the step-by-step trip planner offered on Google Maps, including information about transit in Baltimore, Montgomery and Jefferson counties, according to the official Google blog. The newly released transit data now available through Google Maps will also provide D.C. metro-area commuters with information on regional transport providers, including AMTRAK, DC Circulator, Fairfax CUE, Loudoun Country Transit and MARC trains. “Google’s promotion of public transit increases awareness of alternatives to driving and gives our riders access to other useful information such as aerial imagery, business listings, user reviews and street views,” said Metro General Manager and Chief Executive Officer Richard Sarles. Although the partnership has taken some time to establish, WMATA has made its transit data available to the general public for use in developing third-party applications for the Internet and mobile devices, the WMATA reports. The real-time data sets are available here.